Seoul: North and South Korea have agreed to close some guard posts along their border on a trial basis, Seoul's defence minister told parliament on Tuesday amid a rapid diplomatic thaw. The Demilitarized Zone that has divided the peninsula since the end of the Korean War in 1953 is, despite its name, one of the most fortified places on earth, with the areas on either side of it bristling with minefields and barbed-wire fences. Song Young-moo said the South would withdraw around 10 guard posts as part of confidence-building measures following the landmark summit between North Korean leader Kim Jong-un and the South's President Moon Jae-in in April. "What it means is that we will first withdraw one or two guard posts and gradually expand it," Song told lawmakers, adding the North would take reciprocal measures. "The North and South agreed to withdraw guard posts that are closest to each other," he added. "The closest is about 700 metres away and we will begin withdrawing guard posts that are within one kilometre." A defence ministry official told AFP the issue was still being discussed and declined to clarify whether the posts would be physically removed. The 1950-53 conflict ended with an armistice rather than a peace treaty, leaving the two Koreas technically at war. 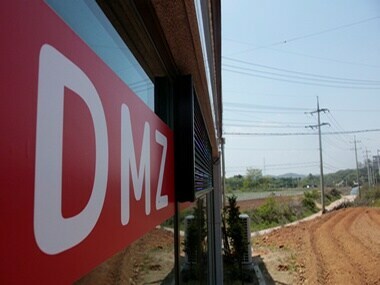 The DMZ, designated as a buffer zone, bisects the Korean peninsula and is about four kilometres wide. It includes a Joint Security Area around the truce village of Panmunjom, where negotiations take place.